The latest e cigarette kit to hit our shelves is the 2200mAh 23 Watt Twist Battery with Vase Clearomizer and Case Kit. This stylish kit is not only eye-catching but is also made up of high quality components to make your vaping experience as memorable as it is pleasing. The Vase Clearomizer and 2200mAh battery work so well together you'll wonder where it's been all your life. 1 - e Go Zipper Case. The Vase Clearomizer that comes with this kit is a top of the line, bottom feeding clearomizer with a sturdy vase shaped plastic tank and brass and stainless steel bass. It comes in several colors and is 510 threaded to fit on any 510 threaded eGo battery. The best feature, which cannot be forgotten, is its ability to be disassembled and rebuilt. This feature means you can take the clearomizer apart to remove the burned out wicks and replace them with new ones, extending the life of your clearomizer and saving your money. This kit now includes our ECU 2200mAh 23 Watts Twist battery! This battery is a huge improvement with its wattage range from 7 to 23 Watts. It gives the user more room to get that perfect hit they are looking for, along with the ability to handle lower ohms. It keeps the same dependable long battery life and features an led coloring system. The Led system gives users insight on their battery life with a blue color of fully charged, a green color of a medium charge, and red to indicate that it needs to be charged. 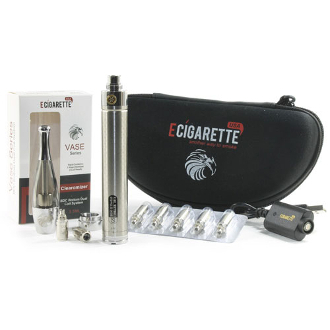 Along with these top notch components, this powerhouse e cigarette kit comes with everything needed to begin (or continue) your vaping journey; A hard sided black E-Cigarette USA case to protect your investment, a USB charger with a cord and wall port, 5 replacement wicks to keep you vaping continuously, a 10ml bottle of e-liquid in your choice of flavor and a stainless steel beauty ring to maintain the continuity of the e-cigarette between clearomizer and battery.